At UCLA, classes are just too large. We pay too much to justify classes with 300 students each, where 30% of the class is required to fail. As a double major in Chemistry and English, I can assure you that learning has been much better and much more worthwhile in my smaller English upper divs, where I am required to interact with other students and the professor more frequently. We bounce ideas around and I feel like I am contributing and receiving more. In my chemistry lectures, on the other hand, I frequently have no motivation to go. There are simply too many students. Not all questions get answered, there is no intimacy, it feels like no one notices or cares that I am trying my best in those classes day in and day out. I love chemistry and my south campus classes, I really do, but there is nothing to justify the huge disparity in class sizes between my 15 person English seminar and my 200 person chemistry lecture. At that point, what am I even learning? Why do I bother coming to class? 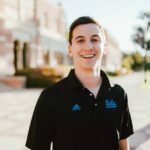 UCLA needs to focus more on its students than on its research, and hire more professors who are willing to teach so that we can have smaller and more effective classes. I LIKE YELLING. I FEEL IMPORTANT AND JUSTIFIED WHEN I CAN YELL AT SEVERAL STUDENTS ABOUT ELECTRON SHELLS AND ORBITALS AND THEN PRETEND I DO NOT SEE THE AWKWARD QUIET KID IN THE BACK WITH HIS HAND HALF-HEARTEDLY RAISED. YELLING IS BETTER BECAUSE IT CONVEYS IDEAS WITH GREATER CLARITY AND ALLOWS FOR ME TO EASILY EMPHASIZE IMPORTANT TOPICS, SUCH AS CHEMISTRY. ALL OF CHEMISTRY IS AN IMPORTANT TOPIC. RESEARCH INDICATES THAT STUDENTS RETAIN INFORMATION 56.4% BETTER WHEN FEAR IS INVOLVED, AND YELLING IS A GREAT WAY TO INVOKE FEAR. IN ADDITION, YELLING ENSURES THAT THE STUDENTS IN THE FIRST ROW GET A GREAT FIRST HAND EXPERIENCE WITH MY STINKY BREATH AND YELLING LUNGS. CHEMISTRY IS FUN. SCHOOL IS FUN. I LOVE RESEARCH.